Leather from the Abyss is an Etsy shop stock full of goods handmade from 100% leather. 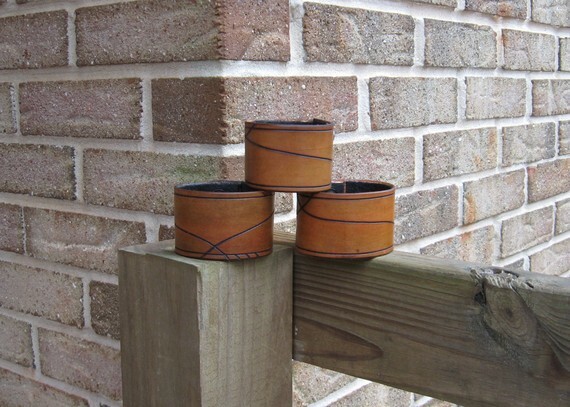 Offering belts, cuffs, bracelets, pendants and more, all items are hand cut, carved, stamped dyed and stitched. 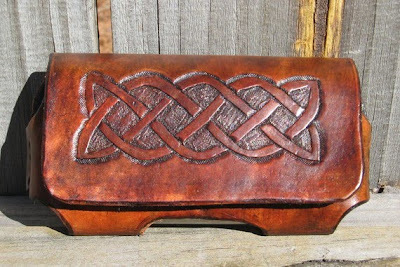 Leather from the Abyss is owned by a husband and wife team from Georgia. Jenn takes care of the business side and all things Etsy while her hubby Mike makes the creations you see in the photos. I am sure you will all agree that together they make an awesome team! Also note that they do welcome custom orders! Give your child an accessory that they can wear now and treasure as a keepsake as an adult. This belt can be personalized with letters, hearts, butterflies, leaves and more. 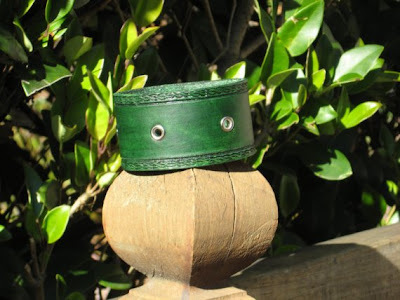 Dyed a gorgeous deep Emerald green, this leather bracelet has 5 silver eyelets and hand tooled edging. By specifying your size upon purchase it can be made for a perfect fit! 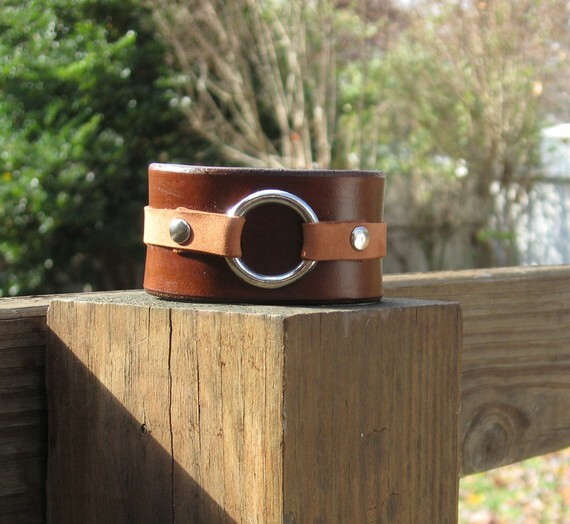 Leather from the Abyss is helping to kick off the 2011 "Have You Seen This Etsy Shop?" in a big way! This week there is going to be not one but TWO winners! That's right two names will be drawn with one winning the dark brown cuff with silver ring and the other winning the signature design cuff! 1. Check out Leather from the Abyss. Come back here and tell us your favorite item(s). 3. Be or become a follower of Joy De Vivre on facebook,(the link is on the sidebar). Entries will be accepted from now until next Monday at noon. Check back Monday night to see if you are one of the lucky winners! These are so cute!! I loved the black diagonal cuff. I love the Leather Pendant with Dragon Concho, very unique looking. Love all the cuffs and key fobs too. following on google as jhb. I reay like the Love n Hearts cuff from the site! The pieces are sooo cool!! I like the rustic and chic look of all the cuffs.